Surya's upcoming film '7am Arivu' which sees Surya in a sci-fi thriller for the first time ever. Not only that, this film will see the actor sharing screen space with Shruthi Haasan, who will be making her debut as heroine in Tamil with this A.R. Murugadoss project. Right from the word 'go' this project has been garnering media attention for the various stages of filming it has crossed. With the shooting of the film wrapped up long back and the post-production work going on at a brisk pace the audio release of '7am Arivu' is to take place sometime soon. With the latest posters of the film getting out Surya fans and movie lovers are awe struck by the yogi's (a monk) pose that Surya has struck in the film. Rippling all muscles and with long hair and a beard to match, the actor is touted to appear in this makeover when the film begins. His fans will get to see him in this avatar for a little less than half an hour in the beginning of the film. Surya appears as a Buddhist monk from the medieval era. The actor's avatars, in '7am Arivu', transition into a scientist and later as an acrobat as the film gears up for an adrenalin-pumping climax. 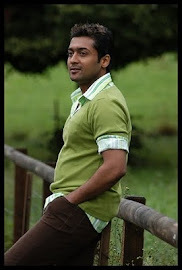 Surya has also undergone special training for the acrobat's role that he has portrayed in the film. Touted to have performed some dare-devil stunts the actor is all set to impress his fans and film lovers with '7am Arivu'.